iDVD is a DVD creation software application made by Apple Inc. for Mac OS X. iDVD allows the user to add QuickTime Movies, MP3 music, and digital photos to a DVD that can then be played on a commercial DVD player. It is often considered the last step of Apple's iLife suite, bringing together all the other iLife applications' results onto a removable medium. It is comparable to its Microsoft Windows alternative Windows DVD Maker. The following step by step tutorial is going to show you how to convert WMV to iDVD compatible QuickTime movie format so that you can import WMV into Apple iDVD project using Mac Video Converter. 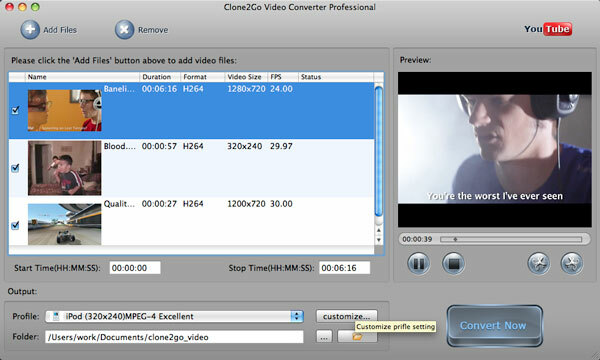 Download the latest version of Mac Video Converter, install and run it. Click the "Add Files" button to import the video clips stored on your Macintosh HD. Then you can get the video information in the manager panel. After the video files are imported, go to the "Output" panel. Extend the "Profile" drop-down list to choose the format that best fits your needs. Here, just choose QuickTime Movie (*.mov)" as the output format. After all the necessary settings, just click the "Convert Now" button to start converting WMV to QuickTime MOV for importing into iDVD project on your Mac machine. Note: You may not be satisfied with the profile provided to you. In this case, you can click the "Customize..." button next to the "Profile" box to customize a profile. In the following "Profile Settings" Window, you can adjust Video Size, Frame Rate, Encoder, Bitrate; Audio Sample Rate, Channels, Encoder, Bitrate, etc to meet your specific needs.